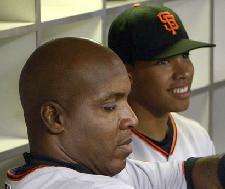 *The 20-year-old son of former San Francisco Giants star Barry Bonds has pleaded not guilty to five misdemeanor charges stemming from a fight with his mother. Nikolai Bonds flanked by his famous father, appeared at San Mateo County Superior Court on Tuesday. Police accuse Nikolai of throwing a doorknob at his mother, 45-year-old Sun Bonds, and spitting in her face during a Dec. 5 confrontation in Menlo Park, in the San Francisco Bay area. Officers also say he blocked his mother from leaving, destroyed property worth $400 and threatened an officer. Nikolai Bonds faces charges of battery, false imprisonment, vandalism, making threats to an officer and obstructing an officer. The court commissioner granted a restraining order to bar him from contacting his mother or coming within 100 yards of her.